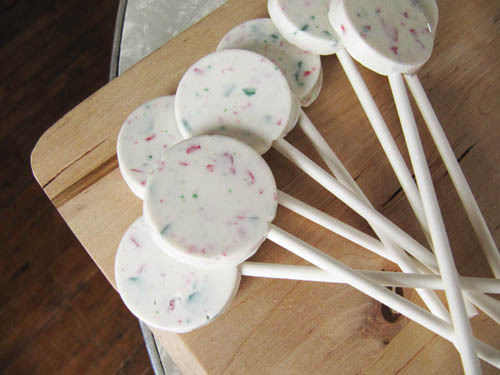 I had a dream about these lollipops on Friday night. So, of course, I made them Saturday night. I made these the easy way. There are only two ingredients. 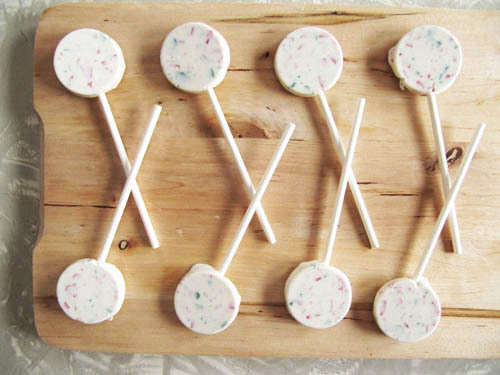 White chocolate and peppermint crunch candies. Cake and candy supply stores are the place to get the ingredients AND the lollipop molds and such. I’ve had these lollipop molds since July and I’ve been trying to think of fun things to make in them. I guess I should’ve been looking in my dreams for ideas. I’m adding these to my cookie boxes this year. Why not, right? * I used 1/3 of a bag meant to be mixed into 3 lb. of chocolate. ** Or if you’re in the Detroit area go to Sarah’s Cake & Candy Supplies to get your supplies. 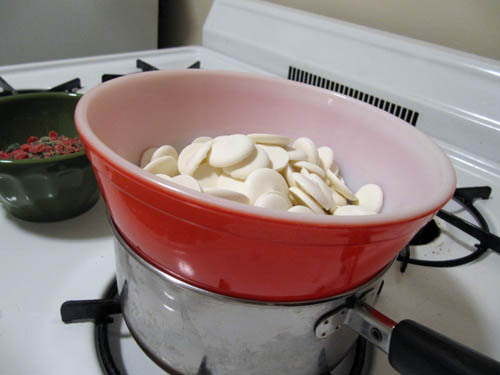 Melt white chocolate in a medium heat-proof bowl over a pot of simmering water, double-boiler-style. 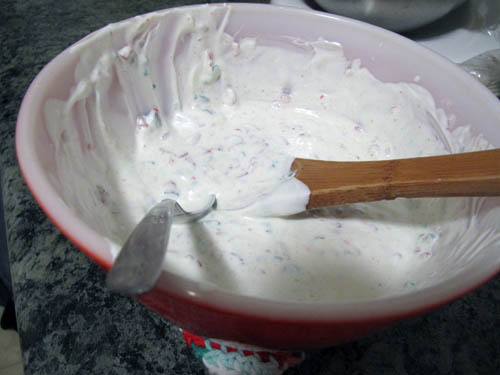 Stir in the peppermint crunch candies. 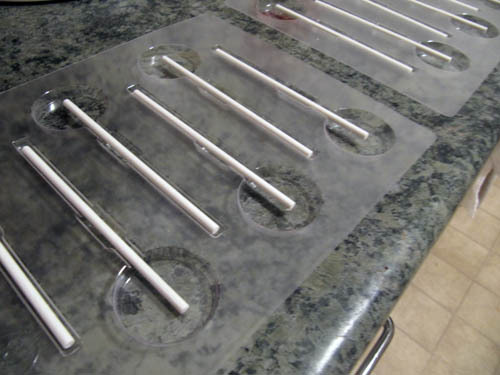 Place the lollipop sticks in the lollipop molds and spoon the candy mixture into each of the lollipop circles. Place in the freezer for a few minutes, or until solid. Place in an airtight container and refrigerate until time to snack! Lollipop prep! Sounds like a school that I’d want to attend. That’s funny, these are the second peppermint bark thing I’ve seen today with white chocolate. I’ve always made it with dark. Maybe I’ve been out of the loop! Not sure how I missed this post until now, but man, I really want to make these. Just need to get a lollipop mould.